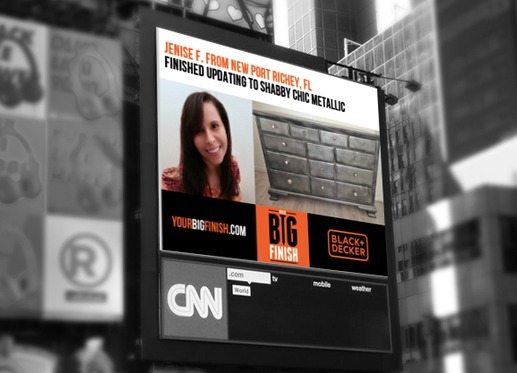 My name is Jenise and I’m a concrete-a-holic. If you’ve been following along, then you may have figured that out already. While my concrete designs thus far have been pretty basic, which has been great because I love the industrial look of raw concrete, I have been wanting to create more sophisticated designs. I love the look of polished concrete, not to mention the amazing colors and designs that can be achieved. When I think of all the creative concrete possibilities, my mouth waters. The only problem has been that I’ve lacked the necessary knowledge to create all the wonderful designs floating around in my head. So I’ve decided to further indulge my addiction and sign up for The Ashby Systems Countertop Solutions Training Course. Sure, I could have found a book on the topic, but I’m much more of a hands on person who enjoys learning by doing. So the opportunity to be totally immersed in a 3-day course was something I could hardly pass up. During the 3-day class, participants will be actually making a small kitchen. How cool is that?!! 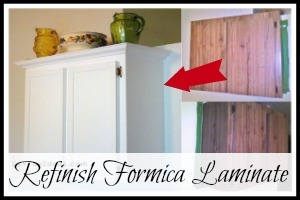 Some of the things I’ll be learning while making my kitchen include how to create decorative edges. Classes are small — no more than 15 participants and are taught once a month. I’ll be attending the December 2-4 class in Vegas. Then watch out cause I’ll be DIYing all kinds of cool concrete creations and sharing them with you right here. Did I say I was so excited?!! If you’d like to join me in the December class to learn how to make concrete counters like the pros, you can learn more about it right here. 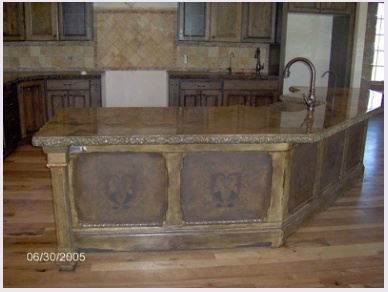 All of the images above are Countertop Solutions creations and examples of the kind of concrete skills that I will be learning during this hands-on course. Yay! And if you can’t wait until my December class, check out some of the fun concrete DIYs that I’ve already done…. 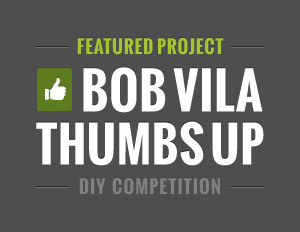 « THE ULTIMATE DIY LINK-UP PARTY! Wow, I have never seen a concrete counter before. Around here most people have granite. Oh my goodness, Robin, they are so BEAUTIFUL! 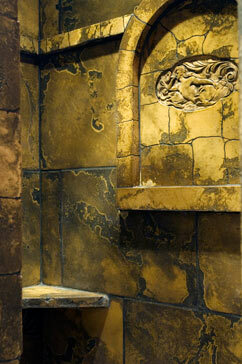 Plus, they’re considerably less than granite and you can create any color combination you want. 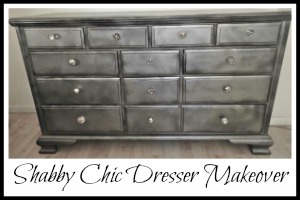 Or, simply keep the original gray for a fun industrial look. I can’t wait to jump into this course and start sharing my new concrete creations! I really like this look.. i would like to do this in our kitchen, but we are a aways away from redoing it..
Wow, these are really different, I normally see granite or marble. Have fun in your class. Thanks so much Carmen! I can’t wait to get started and share my experience. Wow that is so cool! I could never make anything like that, even if I had the right tools! I am just sooo not good with that sort of stuff! I bet you could, Taylor. What I’ve found in my DIY-ing is that a lot of things look complex, but when you break down the steps, it’s usually pretty easy. Oh wow, these are SO beautiful. 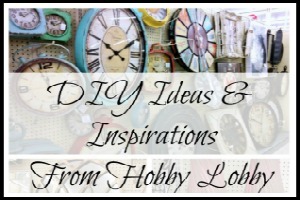 And I also really love a good DIY tutorial :D Thanks for sharing. Thanks JoAnna! I’ll do my best to make my tutorials “good.” Lol. 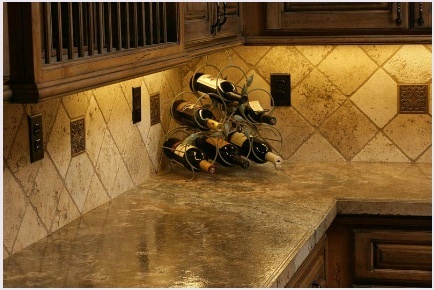 I’ve always loved the look of concrete counters, but never realized they were concrete! Amazing. It really is amazing what you can do with concrete, Nina. So can’t wait to get started! I didn’t even know you could make concrete counters but they look beautiful. Thanks Debi. 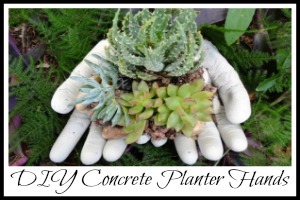 The best thing is that there is sooooo much versatility in what you can do with concrete! Those are some great ideas! This is something I would like to do in the spring. I’m so glad you’re thinking about doing this! Will definitely share all the info with you when I get back! This concrete workshop would really help you create the kitchen you want. You can be more hands on the design after this. Absolutely Franc. And I love getting my hands dirty! That’s quite a class! Learning to make concrete counters sounds amazing. Yes, Elizabeth. I expect the class to be amazing. Can’t hardly wait! Wow! Those are really unique countertops! 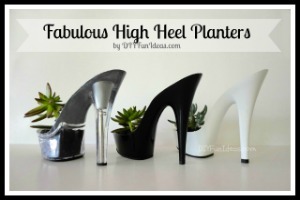 :D I don’t have anything to DIY like that at home but they look nice! They really are unique. It’s so amazing all the things you can do with concrete! These pieces are fantastic. I would love to learn how to make these beautiful creations. They certainly are fantastic Ann. And this is the perfect class to learn more. Can’t wait to share my experience with you! Its certainly a unique rustic look. Not sure it would fit my home though. 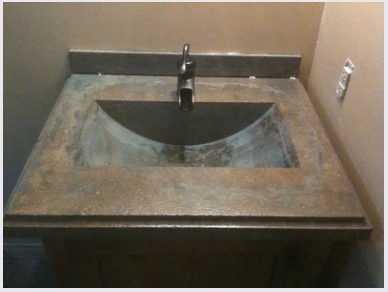 Part of the beauty of concrete is that it’s so versatile that you can make it look ultra modern or rustic. You can make it look like granite or marble or most any kind of stone. 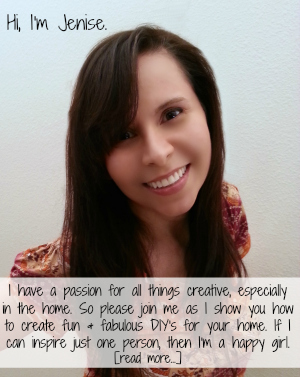 I will be glued to your blog to see what you create. Good luck with your training in Vegas. Oh my goodness Shelley, that’s so nice of you to say! I can’t wait to share more from my class! That is very classy I must admit. Thanks for sharing. I’m so glad you like it. Can’t wait to share more about the class! That’s fun that you learn by doing. I’m just the opposite and have to read and read and read first. :) Everything here looks great. I usually do spend a lot of time reading up before moving forward with a project. But getting your hands dirty right away can be fun too! Love the look. Even Though it won’t fit with my style. Thanks Letty. Part of the beauty of concrete is that you can adapt it to most any style, making it look modern or old world or whatever. I love concrete floors and counters. I wouldn’t mind having either someday. They seem easy to keep clean. And with all boys we need that! Well, hopefully you’ll be able to make your own when you’re ready. It’ll save you tons of money. I know, isn’t it amazing! Can’t wait to share more about my class! That is SO cool! 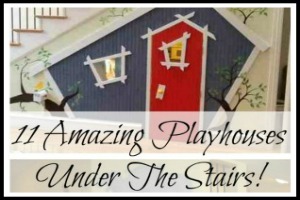 We are about to move into a fixer-upper so this class would be perfect! Oh, I hope you definitely consider taking the class. Can’t wait to share more about it in December. And I plan on starting a renovation in a mother-in-law apartment next year, so maybe we’ll end up fixer-uping together. LOL. What great classes you have to offer. 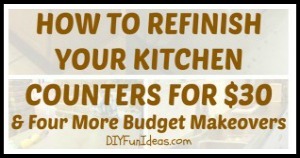 This would be great for someone either wanting to redo their kitchen or garden. I would be afraid of messing my counters up. Well, I’ll be sharing more after I take the class. 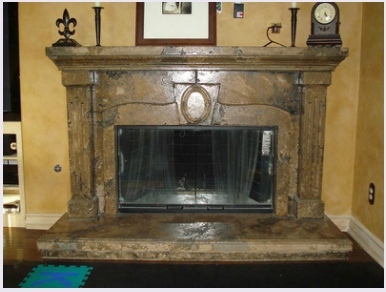 But concrete is not very expensive to work with so you can always start with a small sample piece first if you’re concerned about your technique. i love the concrete hands! The kitchen looks amazing! Awe, thanks so much Becka! Can’t wait to start adding some pretty concrete counters to my parents’ kitchen. That’s the plan for after the class. Then planning a renovation for a small rental too. This looks so neat. Have a great time. Looking forward to seeing your creations. Thanks Kristin! Can’t wait to share more during & after the class! Man, I can’t wait to see the results of what you learn in class. You’re right, the concrete looked great in those kitchens in your photos. Wow making a small kitchen would be very cool. 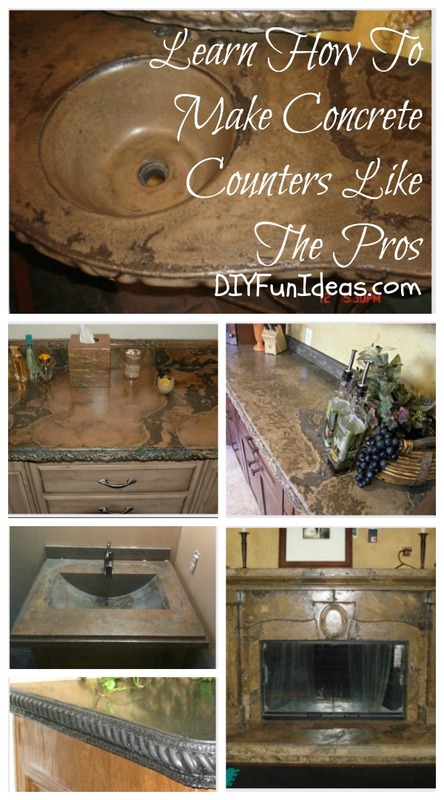 I love the look of concrete counters but I’m not crafty enough or have the interest to learn how to do it. I’d love to see how your project turns out. Thanks Erica. I can’t wait to share more from the class! Sounds like you will have a lot of fun! Can’t wait to see what you create. That is fantastic! Absolutely gorgeous!! This seems like it might be too much for me, but I sure would like to learn! Thanks Danielle. It can seem a little intimidating at first, but the class will certainly help anyone get over that. Those counters seem to be a bit too advanced for my minimal carpentry skills. Haha. Well, they’re a little advanced for me too right now. :-) That’s why I’m taking the class. But from my experience, things that look advanced usually aren’t too bad once you break it down step by step. I can’t believe that all of those surfaces are concrete. That is beautiful. I want to learn more. It is hard to believe Kathy. That’s why I just love all the things you can do with concrete. It’s really such a fun and versatile medium. Can’t wait to share more with you when I get into my course! I will be fascinated to see the results of your course. I have seen plenty of concrete used in doors that I love and plenty that I hate. I think it really depends on your sense of style. Absolutely Nicki. But I do think there’s still beauty in so many of the creations that don’t match my style. And I’m excited to share more with you after my course. You’re going to learn so many skills to spiff up your house. That’s an incredible class! It certainly sounds like it will be pretty incredible. Can’t wait to learn more and share with you! This is so amazing! I’ve never seen a concrete counter before and it looks so nice! Thanks Chrissy. It definitely is pretty amazing. Can’t wait to share more from my class! How cool! Those are beautiful countertops – I’d never guess they were made from concrete. How easy are they to keep clean and in-tact? Do they stain or get crevices in them? 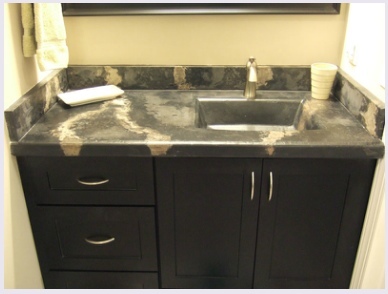 Concrete counters do need to be sealed to prevent staining. And as far as crevices, the material is so strong so that really shouldn’t happen. sounds like a n exciting course! I can’t wait for your creations! Looks fabulous! My sister is so good with DIY projects. I’m going to tell her about this one! Gorgeous! And all the other projects are cool too! Thanks for all the ideas! You are the queen of concrete! 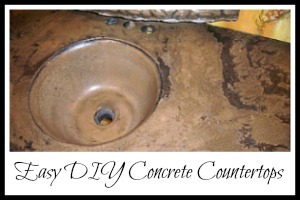 Love concrete counters! Tanks for sharing with SYC. Hi Jenise, how did the class go? I haven’t seen any replies or comments since your November comment. Are you ready to teach yet?? Let me know if you any questions after you check it out. I’m happy to help! OMG, you are my hero! I am 50 ?? Female remodeling a mobile home from the ground up. After a 27yr marriage divorce has sent me on an amazing adventure. I am eventually planning on moving my little piece of heaven to family lake property, so I am remodeling to my very own taste. 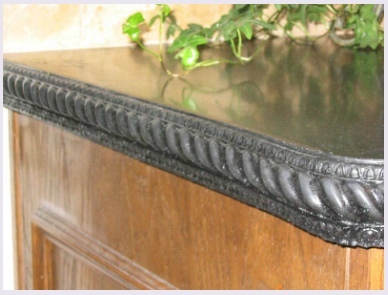 My question is where to order the molding channel to do the larger rope edging.